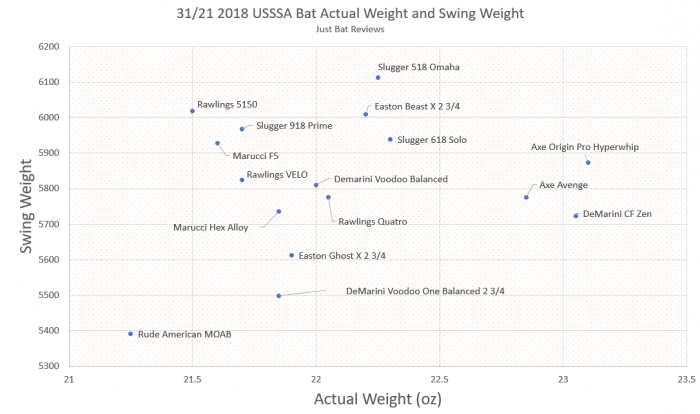 We measured the swing weight of almost every 31/21 drop 10 USSSA 1.15 bat for 2018. Most bats, regardless of their actual weight, fit well within the drop 10 swing weight range. The lightest swinging Rude American was less than 13% lighter than the heaviest swinging Louisville Slugger 518 Select. But, as a group, all but three bats were within 5% of each others’ swing weight. Considering our margin of testing error is +/-200 it is safe to say that the vast majority of drop 10 bats, regardless of brand and model, take the same amount of effort to swing. This article goes hand in hand with our BBCOR swing weight and USABat swing weight articles. What are the Speed, Balanced & Endloaded Drop 10 Bats? While we wait for the marketing departments of bat companies to get away from the remarkably uselessness of the “drop” we are left to categorize bats into different swing-type buckets. We like the idea of three: Speed, Balanced and Endloaded. In effect, this divides the mass moment of inertia (MOI or swing weight) spectrum into a low, medium and high. If we were forced to categorize the 2018 USSSA Drop 10 31-inch bats into a speed, balanced and endloaded section it would look like this. Note, too, we left the DeMarini Voodoo One and the Rude American MOAB speed off of these lists because we believe they should be categorized as “drop 11” bats. Granted, their ACTUAL weight fits right in line with most of the bats above. However, in terms of player usefulness, they simply sit too far outside the spectrum to be considered peers of the other drop 10 bats in the market. This is not the fault of DeMarini or Rude American. Bat vendors and marketers have forced drop categories upon the otherwise unsuspecting public and bats ultimate need to be made into specific buckets or they will never sell because no one will ever be able to find them. Despite all that, those in the drop 11 world might consider a “drop 10” Voodoo One or Moab Speed. As we mention in our BBCOR and USABat swing weight sections, it is vital to understand that total weight is not the same as the swing weight. The chart proves this well enough. There is no strong correlation between the increase in the bat’s actual weight (represented by moving to the right on the chart) and the bats swing weight (represented by moving up on the chart). We simply can’t make a claim on a bat’s swing weight by weighing it on a kitchen scale. Rather, as we document this process elsewhere, we must find the swing weight of the bat. The swing weight is much more a function of how a bat’s weight is distributed along the bat instead of how much weight there is. We normalized every swing weight in relation to the Rawlings VELO—which found itself in the rough middle of every USSSA bat we measured. You’ll see below that the vast majority of bats fall within 3% of the Velo’s swing weight—basically an imperceptible difference for hitters. The only bats worth considering as noticeably different than the bulk of drop 10 bats in the industry are the Slugger 518 Omaha which runs 5% higher than the average, the Voodoo One (6% below the average) and the Rude American Moab (7% below the average).